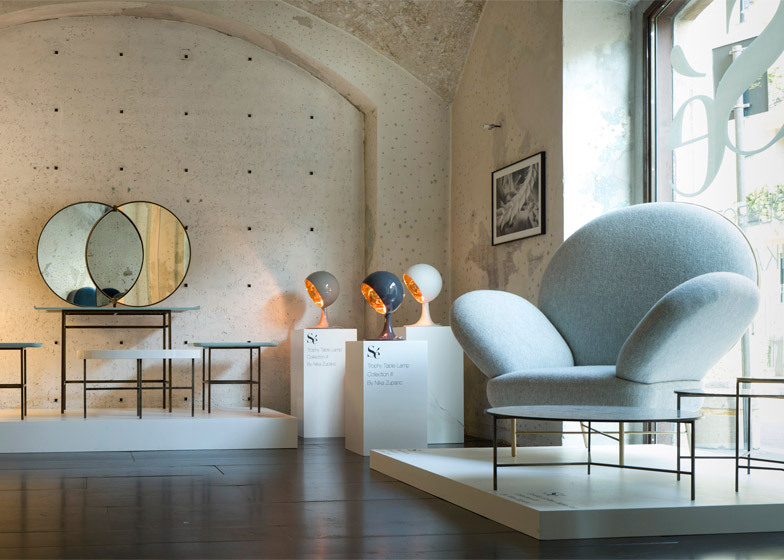 Milan 2015: Slovenian designer Nika Zupanc has added more furniture to her collection for London design label Sé, including an oversized armchair on slender steel legs (+ slideshow). 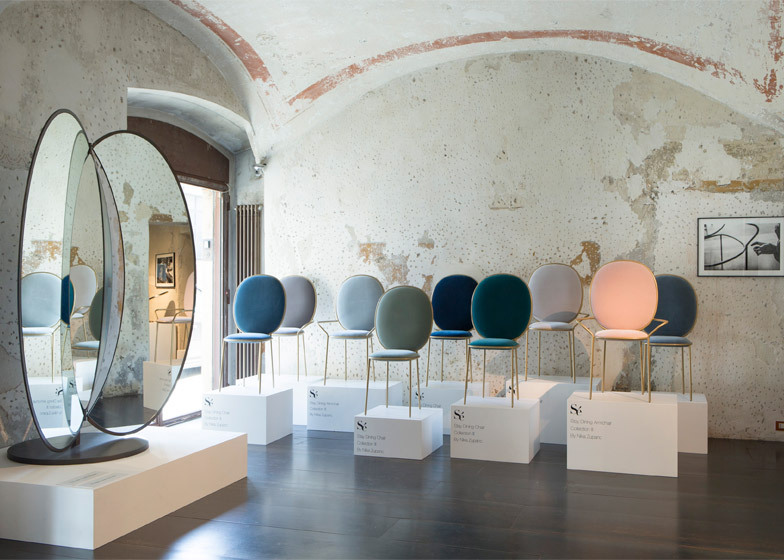 Zupanc has added a sofa, an armchair, dining chairs and a range of mirrors to Sé's Collection III, as well as updates of previous designs. 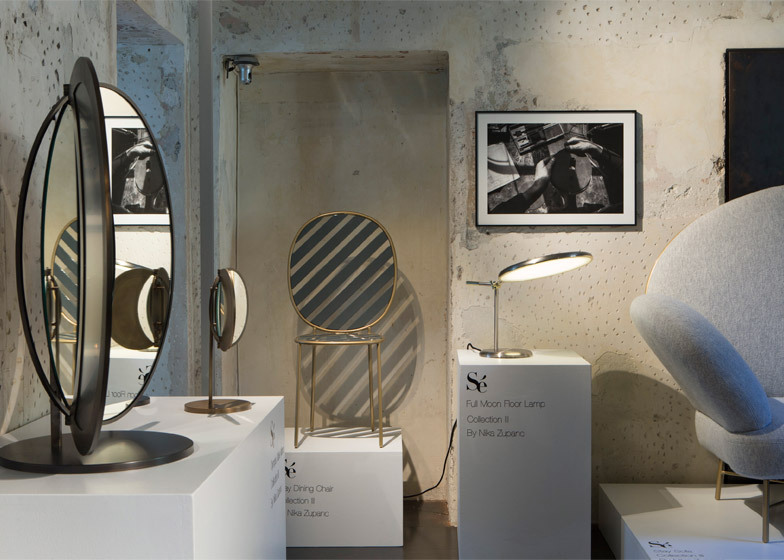 The new products were presented at Spazio Rossana Orlandi in Milan during the city's design week, occupying the same space that the original collection was launched in last year. 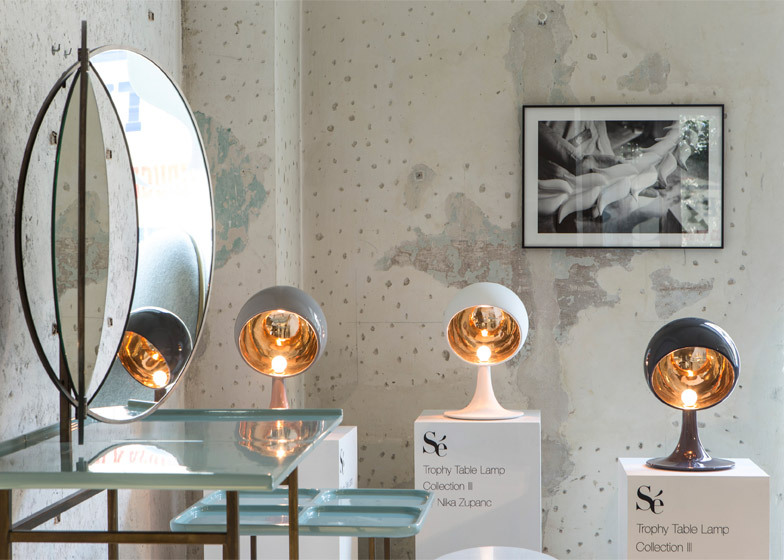 The collection is the third produced by Sé since it was founded by Pavlo Schtakleff and Marc Sharifi in 2007. 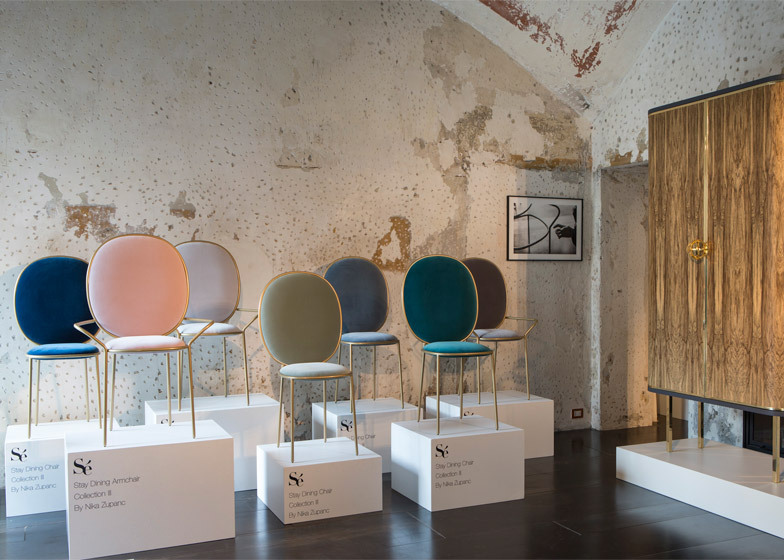 Nika Zupanc bases furniture collection for Sé on "an imaginary private sports club"
"The basis of this collection was very much inspired by the 1950s, a take on the glamour and elegance of the period," said Schtakleff. Zupanc said she had combined elements from 1950s Modernism with the aesthetics of sports venues. "My vision can be most beautifully portrayed with iconic setting of a private sport club, stadium, Olympics, or even a gym," she told Dezeen. The Stay Dining Chair comprises a rounded upholstered back and seat. The gold powder-coated steel tubing frame appears like piping on the upholstered cushions, and the same material is used for the chair legs. The chair is available with or without arms and upholstered in a choice of coloured fabrics and leather. The Stay Armchair sits on the same slender legs as the dining chair but much closer to the ground and has a larger bulging back. Two padded elements stick out at 45 degrees from the matching seat to form armrests. 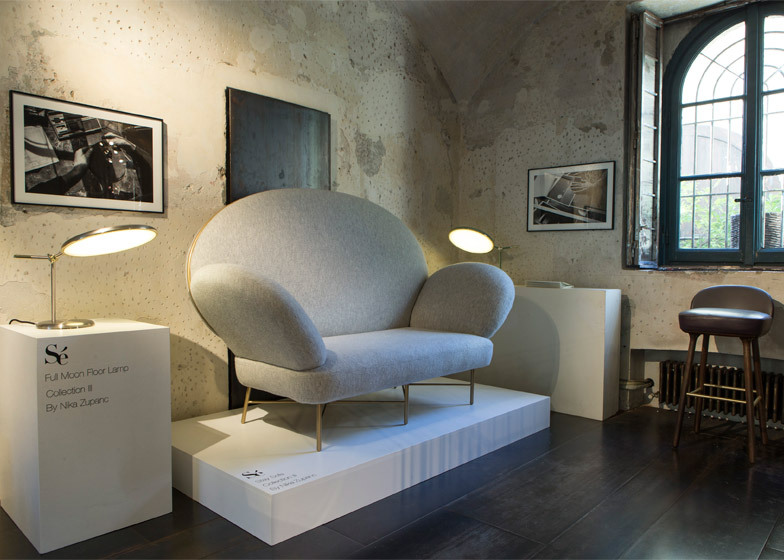 The armchair is also available in a two-seater sofa design. 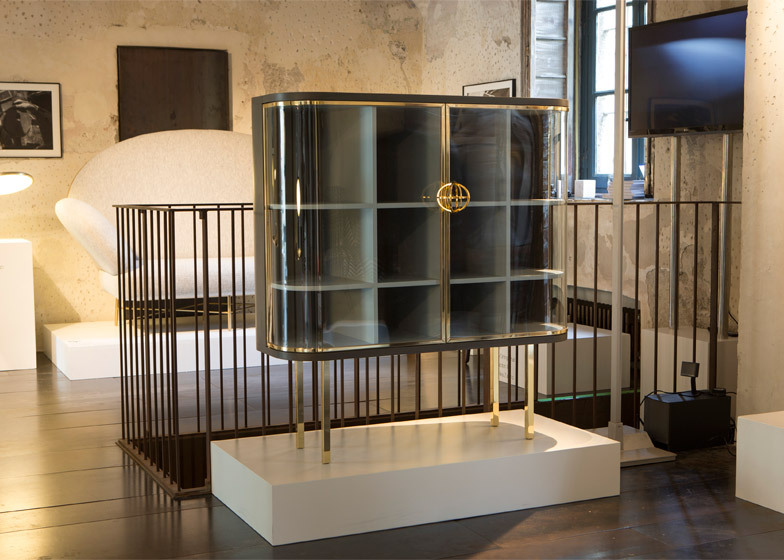 Zupanc has also adapted a mirror design that previously sat atop a dressing table to make it freestanding. 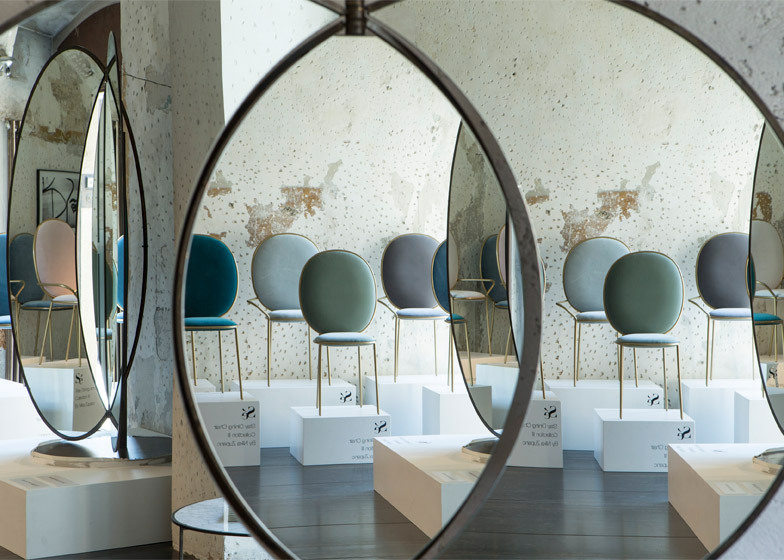 The mirror comprises two offset intersecting circles, with a straight central support that is used to hinge a middle panel, providing reflections from different angles. 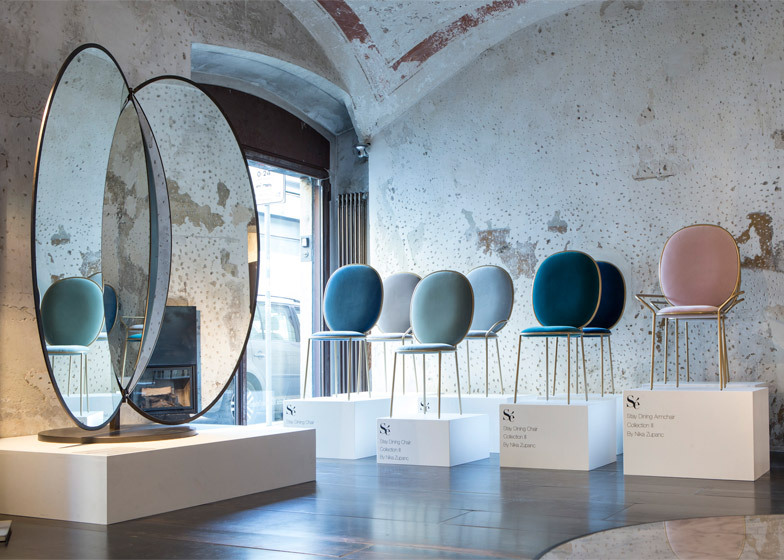 "Following the last year's success of the Olympia Vanity Table and its triple mirror, we added this mirror in three new variations from a very small one to a very big one," said Zupanc. "The self-standing one acts almost like an installation in the middle of the room, playing tricks with visual perceptions of the space around you." 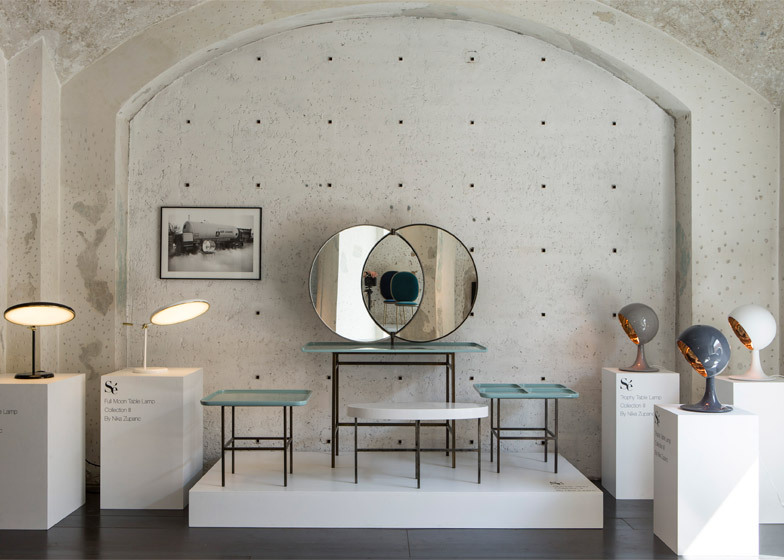 The Olympia Mirror is available in three sizes with a frame in acid-stained iron, lacquered iron or brushed brass. 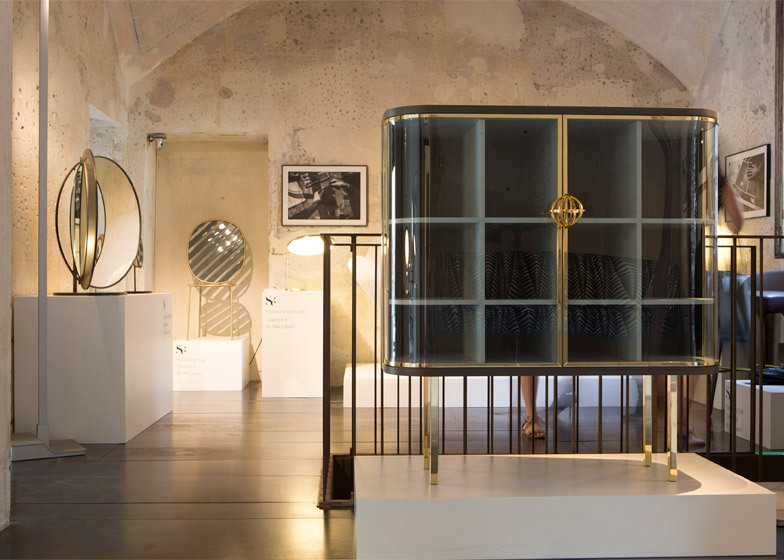 The glass-fronted Loyalty Cabinet from last year has been created in a smaller version and also updated with wooden doors. Updates have also been made to other pieces including the Full Moon Lamp, which is now available as a floor version. "I felt I needed to create some sort of unexpected luxury, but within a minimal, clean design language, with the use of solid, basic, long-lasting materials and basic industrial production techniques," Zupanc told Dezeen. "The collection finally feels and looks like a complete statement, like a series of strong, elegant, sentences, that make all together a beautiful story," she added.